Some of the best practice we’ve seen has been in some of the worst designed environments we’ve seen. But, the staff have to put vast effort into counter-acting the safety, social and therapeutic impact of inappropriate environments. Hospitals burdened by old buildings (even the 1970s produced what are now recognised as hopeless environments) can nevertheless make wards look much lovelier and operate more effectively with some relatively inexpensive changes. Happily, the new generation of hospitals have individual ensuite bedrooms, layouts which help rather than hinder staff being connected to patients, style, delightful artwork and the strong sense that patients are cared about and for. Harrison House in Grimsby exemplifies the 21st century approach to mental health hospital design. “The environments in which we live and work have a profound influence on our physical and psychological well-being. In health care settings the environment can support recovery and well-being and has a real effect on patients’ perception of the care they receive. This goes beyond the necessity for cleanliness, infection control and the preservation of an individual’s privacy and dignity, to creating spaces that are fit for purpose and comfortable. Research has repeatedly confirmed that a supportive and welcoming environment can have positive effects on both those who visit hospitals – whether as patients or visitors – and those who work in them”. It’s often possible to detect, before being informed, if a hospital has been blessed with an Enhancing the Healing Environment (EHE) make-over. The distinctive features are style, boldness, visual pleasure and artwork. Whether it’s an entrance, a waiting area, a ward or a garden, it will be attractive, welcoming and above all conveys the strong impression that people using the space are valued. How rooms, corridors etc are decorated and visually enhanced. (We’re of course not going to be referring to pimp your ward.) It’s amazing what a difference a few stylish scatter cushions and some classy paintings can make. Signage. This goes way beyond helping people (including visitors) navigate the ward, avoid barging into the wrong room etc. The look, ‘personality’, tone etc of signs conveys strong messages about how patients are valued and included – for example, what sign, notice or information is on the staff office? Does it encourage or dissuade patients from finding a member of staff when they need one? We’ve seen fantastic examples of creative signage. How much easier, more pleasurable and generally uplifting must it be for an elderly person with dementia to find their way to this room in Ramsey Ward, Kent than if it just had dull (and tiny!) standard NHS sign. More on Ramsey later in this feature! The ward was designed in such a way that our personal space was protected and respected yet it still felt inclusive and almost homely. When I walked onto the ward I thought I was in the wrong place and had been checked into some lovely health spa. It was designed to be a calm, relaxing, welcoming place. The staff don’t disappoint either! Some of the ward went on a trip to the garden centre. We bought plants for the ward. It looks so much nicer. I have my own ward plant to look after. It’s now flowering! Every time there was something to celebrate we would decorate the ward in a theme. We even used to have competitions between wards on who could do it the best. I found myself always sitting in the same chair in the lounge so I moved around to different chairs. It got me out of my comfort zone and got to know others. The ward was great; it was very modern, and fresh. The rooms were en-suite with a lot of space. Feeling at home is important and telling staff if you don’t is crucial. I was surprised (in a good way) that the ward was nothing like One Flew Over the Cuckoo’s Nest! And no padded cells, straightjackets or men in white coats! 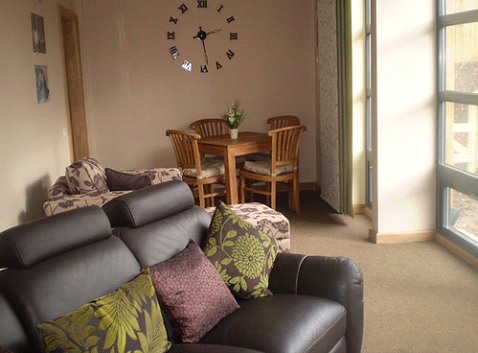 The lounge is cosy and has comfy sofas and chairs and a widescreen TV with Freeview. Perfect for chilling. The ward was a kind of sanctuary for me when I most needed it. I think private space is important. I’ve just heard a designer on Radio 4 talking about: “The idea that the eyes feel.” It’s such a great expression. So vivid. Our visual sense is so strong that it’s the equivalent of a physical sense of touch, or of emotions? What we see certainly can have a substantial impact on how we feel, about our environment, the people we’re with, visitors and, perhaps most crucially, ourselves. Staff rest room and hand-over room but no office. The Nursing station has high, attractively curved wooden front with 2 see-through panels for the vertically challenged. Lovely art room with windows right along the curved wall. Conservatory for family visiting room. Nappy change facilities in loo next to family room. Now being included in all new builds. A ward for elderly patients has an open plan kitchen in the central area of the ward. The smoking room has been converted to a very mellow, spa-feeling massage and complementary therapies room. The ward had benefited from a fabulous make-over courtesy of the King’s Fund’s Enhancing the Healing Environment. The overarching themes were ‘warmth and calm’, although one of the improvements was to make the ward less stiflingly hot in the summer. An increased sense of space was achieved by knocking three rooms into one lovely, open plan space, with dining, lounge/TV, hot drinks and pool table areas. 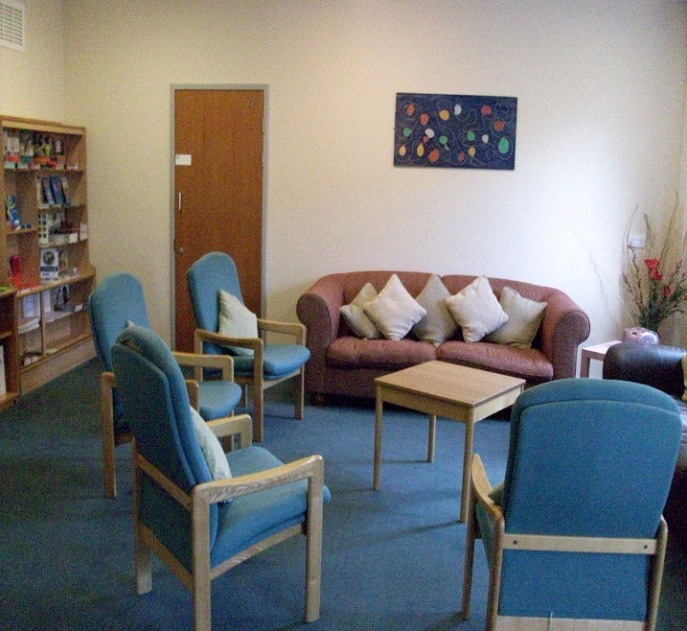 The ward has a room that provides tranquillity and relaxation during times of distress. 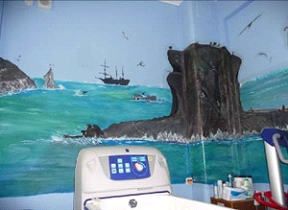 Patients have helped decorate the room with an image of a lake and mountains and an ‘under the water’ theme. Once completed, this room will be an area that patients can use readily for reflection, relaxation and therapy sessions. There are various ‘chill out rooms’ including lounges and visitors rooms and an open recreational area. Fabulous art-work everywhere, including individual pieces in each bedroom. Different sizes (including huge) and all done collaboratively with patients, with some being joint projects with local artists. As well as a patient-designed motif within the laminate flooring, there are several pieces of furniture which are as much sculptures as things upon which to sit and have a sarnie. The entrance area has a breathtakingly beautiful series of connected seats, sculpted from wood by designers whose work is in the V&A! There are other trendy seats in the garden, with blue and green swirly metal sides. And in keeping with the generally arty theme, one of the courtyards is… a sculpture courtyard! Lovely art in corridors, and immediately you come in front entrance. Ward is decorated with glamour pictures of ladies’ fashion from the 30s and 40s and staff were actively involved with those patients who were awake, doing jigsaws or looking through magazines together. Nursing assistant is talented photographer and ward is decorated with beautiful water-themed photos. The first thing that greets you is a lovely framed local photo, with an accompanying narrative about the photo. The ward has a smart, hotel-like feel, with large pieces of stylish art, from specially commissioned local photos of nature. There are cleverly designed transparencies (taken from the commissioned photos) on some of the glass external doors and a few windows to increase privacy. Refreshingly, wards aren’t named after trees but after local ships (the marina is right by the hospital) and ward doors have a photo of the ship and a short description of it. There were two stunning embroideries, one which featured the first hand-sewn DH logo I’ve seen. Doesn’t sound too promising, but this certificate celebrating the newly Enhanced Healing Environment was magnificent partly because of the bold, incongruous, post-modern fusion of officialdom and art. The artist, former patient Louise Jessup, also contributed a large, long landscape (predominantly in green and purple of course), combining embroidery, quilting and other fabric techniques. Challenging estates’ department – not prescription flooring or magnolia paint. Lovely colours on walls and seating. Senior ward staff and patients painted the walls, and made their own fabric ‘painting’ on canvas to co-ordinate with cushions beautifully made by a member of staff. Everything is glamorously colour co-ordinated, suffragette green and purple, including the deeply hip, curvy (Bonio-shaped) dining tables and matching padded dining chairs. The ward feels very light and spacious. Colour changing mood lighting set into huge skylight in centre of ward. The ward benefitted from the King’s Fund’s Enhancing the Healing Environment initiative, with new furniture, redecoration and artwork. One of the walls was painted in a colour chosen by patients – counter-intuitively it’s red! Apparently this did stimulate quite a bit of ‘discussion’ but it looks really good (it’s an orangey rather than scarlet red) and modern and bright, and is enjoyed by patients and staff. The male/female ‘spokes’ have 4 bedrooms between them, and two sets of connecting doors can be locked to make the rooms part of one side or the other. The ward is (invisibly) zoned to reflect levels of care needed; one end is for more intensive care. They use a traffic light concept on admission – eg a red zoned patient will be allocated a nurse for the shift, green (near discharge) patient is supported by an HCA. This is a simple and excellent concept. Beautiful white light in ward using new technology, and get as much natural light as possible into corridors. Groovy dining room chairs were custom-made by the building contractor, and are cleverly designed to enable people to sit together but with more personal space than on traditional tables. I was told this is particularly helpful for many psychotic patients who find it hard to sit too close to others, and also conducive to people doing different activities (eg one person reading and another painting) at the same time. A fantastic solution to so many of the fiddly and risky problems of patients making their own hot drinks. The same hot drinks machine the canteen has. There’s also a milk machine, which avoids milk in cartons left out of the fridge gently turning into cheese, or those yucky little cartons of white liquid vegetable fat masquerading as milk. A Zip Tap. The water it produces is hot enough for tea/coffee but not riskily boiling. They have devised a Home Planning project. This is designed to help clients pan and budget for setting up home. They cut out ideas from magazines and plan a design canvas, they research budget, sourcing using the internet, and visiting relevant shops. They get a certificate on completion. Have decided not to have noticeboards as these were felt to give too institutionalised a feel. Leaflets etc are on display on sideboard. Repositioning a bed to give better view of outside. The ward is inspiredly set up with a very strong reminiscence theme. Peter, the extraordinary ward manager, told me that the elderly patients with dementia feel they’re living in the past and so the surroundings he and his team have created are familiar and reassuring for them. There are beautiful pictures everywhere, from the entrance to the ward right through to the magnificent seascape mural in the bathroom. The photo shows part of the mural, which the nursing team not only painted but meticulously cut out the birds, penguins etc for and arranged these on the scene. (The whole mural was then glazed to meet infection control requirements. )The two main ward design themes are celluloid stars of the past and planes. There are wonderful strips of pictures of planes, which the staff resourcefully acquired from the nearby Manston airforce museum. (Particularly enjoyed by the male patients.) And for the ladies, a truly remarkable border stretching right round the (big!) ward, which the staff created frame by frame, including punching out hundreds of the little holes that provide film-strip authenticity. And the team even did the fundraising to be able to buy all the decorations. The reminiscence concept is thoughtfully applied in a way that is highly practical as well as attractive and stylish. For example, rather than bedrooms being called 1, 2 etc, they’re named after and feature photos of familiar celebrities eg Charlie Chaplin and Marilyn Monroe. (How amazing to be in hospital, in somewhere as usually stigmatised as a ward for elderly people with organic impairment, and be staying in the Marilyn Monroe room!) And there is a superb reminiscence room, shown in the photo above, with period details right down to the phone and radio.The fantastic detail goes right through to the signage. Rather than dull, institutional NHS signs on doors, to accompany the photos of the eponymous star, the staff painted the names onto the wall with stylish calligraphy. You can see an example of this in the photo above of Peter and the Welcome to Ramsey Ward lettering. The Ablett Unit, Rhyll Changing Rooms! As part of Star Wards we looked at the use of rooms within the Ablett Unit. With the development of the patients coffee bar it was highlighted that patients who had visits from children where unable to access the coffee bar due to its location. The OT activity room and the children’s room was swopped making the activity room more accessible to all patients. Patients were actively involved in the process and in doing so feel they have more of an onus on both rooms. The activity room has been painted and patients have started to undertake art work to be put on the walls. The new activity room has become a relaxed environment with a dedicated resource area with patient information and resources. which includes mind, journeys, healthy lifestyle and community resources information. The room also has a dedicated multi faith area which is work in progress. Healthcare support worker Louise Williams has green fingers not because she likes gardening but due to the painting of a feelings tree. The tree is enthusiastically used by patients to add their feelings on leaf shape paper with the aim of the leaf moving up the tree as the person gets better. It is hoped that newly admitted patients can see from other patient’s comments higher up the tree that there is light at the end of the tunnel! 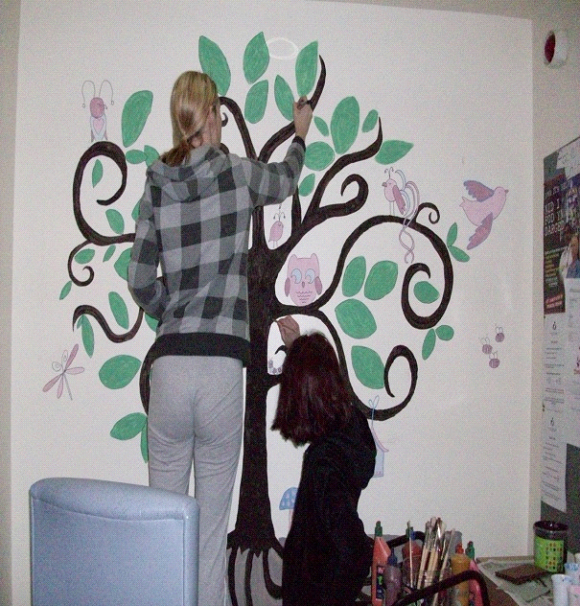 The tree was painted by patients and staff of Dinas female ward. The Department of Health’s ’Inspiring Design Excellence and Achievements’ (IDEAs) toolkit is a design tool to aid Trusts, and their architects and design consultants, to develop their design ideas. IDEAs is intended to help create aspirations towards good design from the beginning of the process and direct attention towards qualities that otherwise are often lost in highly technical healthcare environments. IDEAs treats both interior and exterior spaces as ’places’ where a number of activities commonly take place. It works by understanding these activities and the functional and emotional needs of the people involved. IDEAs can be used either as a standalone tool within a workshop context or as a web-enabled integrated tool by individuals.